The Yew family is mostly found in landscapes as our native Taxus (Yew) is over-browsed by deer. English and Japanese domestic varieties are quite common under cultivation and sometimes naturalize (spread into the wild from cultivation). Yews are toxic. 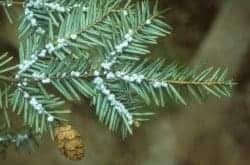 So, to avoid poisoning, the beginner should quickly learn the difference between Yews and the others, especially the Hemlock and Fir that superficially resemble Taxus because of the leaf (needle) arrangement. The red “berry” of Taxus is edible, but not the seed (which is actually visible, indicating it is a gymnosperm, in the cup-shaped “berry”). It is very common for poisonous plants to concentrate toxins in the seeds while producing an innocuous fruit. 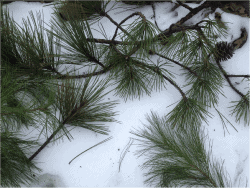 Pinus sylvestris (Scotch Pine or Scot’s Pine) is the most widely distributed Pine. It was brought here from Europe and can normally be found along driveways and cultivated lands. It can be easily distinguished from the other common species by its orange-shaded upper bark and the light blue-green of its needles. It has been used extensively in traditional European medicine and has also been used for pharmaceutical preparations. 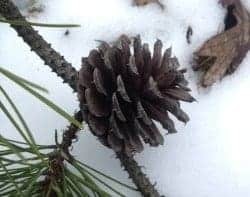 Hemlock (Tsuga canadensis) has horizontally arranged needles with white stripes (giving a pale appearance on the underside) that are dark green above and have been important for survival in the Northeast similar to Pinus. Hemlock is a common tree of stream gorges. It hosts a species of Reishi (Ganoderma tsugae) and is being attacked by a devastating insect, the Wooly Adelgid. The cones are quite small and persist so that they are often found dried but still on the tree. The genus name is from Japanese. The common name is shared with Poison Hemlock (Conium maculatum), which causes a deal of confusion in some circumstances. Poison Hemlock, being in the Carrot Family (Apiaceae) is not very closely related at all. Red Cedar (Juniperus virginiana) This is by far the most common representative of this family and genus in our area. Common Juniper (J. communis) can also be found, but is not so common (despite its name) due to habitat loss and deer browse and is easily differentiated from Red Cedar in that it is a low-growing, spreading shrub. 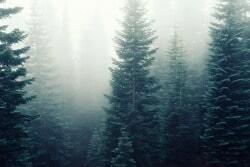 Red Cedar is much more tree-like, though it can’t compete in our peak forests. Sometimes you will find significant numbers dying in the shade of taller trees. Healthy stands are found in old fields and similar locations. They have dark blue berry-like cones. Taxaceae includes only three genera worldwide, only one of which, Taxus, which occurs in this country. Of the nine (estimated) species of Taxus in the world, three can be found wild in the region- one of which is native: T. canadensis. It is the only species found wild in the immediate area, but is suffering from deer overbrowse. The most common place to find Yew is in hedgerows where it is commonly planted. 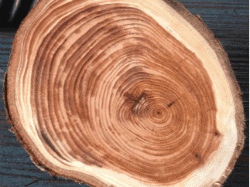 A friend cut down a hedge in Hawley, PA. A slice of one trunk that I have here on the table has 47 growth rings and is only four finger-widths thick (see image below). Particularly in the Northwest, Yew is a favorite wood for bows. It is easy to recognize Yew by the bright red berries (arils), which (as it is a gymnosperm) are open on the end, exposing the seed. The flesh of the fruit is the only edible part of the plant, but the seeds are highly toxic. T. canadensis and Pacific Yew (T. brevifolia) are used to make a pharmaceutical drug Taxol that is used to treat cancer. 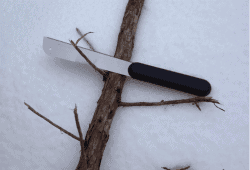 Natives used Yew to treat numbness in the fingers. Yew species can be recognized by their lack of aromatic properties that are present in Pinaceae and Cupressaceae.